A bike that stays in the catalog for 13 years with constant success is a real rarity, particularly when that bike is Japanese. And when that model has set a trend that has changed the face of cycling, it's even more noteworthy! 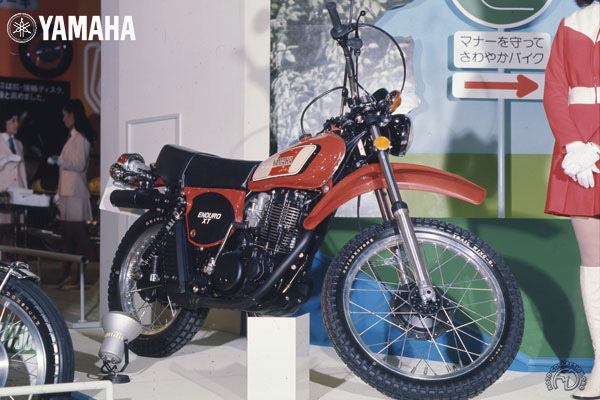 Launched at the 1975 Paris Salon, the XT 500 was the first Japanese off-road bike with a big single engine. It started a revolution and was such a success from the start that it enabled the development of desert racing as we know it today. For starters, it won the Abidjan-Nice rally, then, ridden by Cyril Neveu, the first two Paris-Dakar rallies in 1979 and 1980. Simple and sturdy, it was the ideal bike to ride to the ends of the Earth or use every day, and it didn't let down the amateur adventurers who chose it. From 1976 to 1989, Yamaha sold 196,000 big singles in Europe, 62,600 of which were XT 500s (a third of the company's sales went toFrance). Multipurpose off- road bikes are farand away the most popular today, andproduction has expanded to include single cylindermachines for off road tracks andtwins designed as grand tourers. Even thoughits performance has been overtaken nowadays, the XT 500 remains the bike thatrevitalized the cause of the big single.